have i mentioned that i love 2-strokes? During my last year of school in 1986 we all had 50cc motorcycles. That was the time of the AR?s, MB?s, and RZ?s. 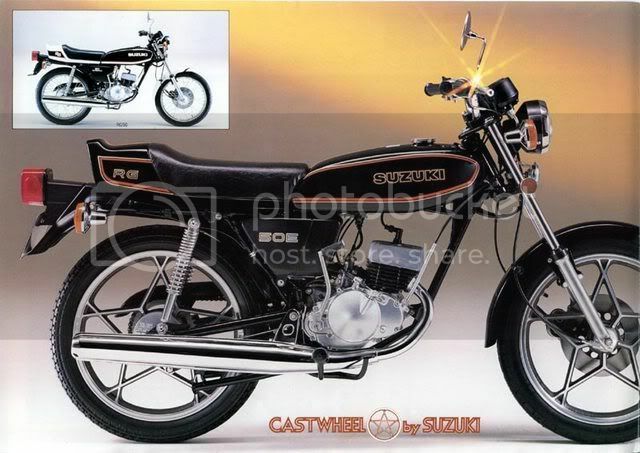 Children from more affluent homes had MBX?s and Suzuki Gamma?s. We really enjoyed those bikes and rode like people possessed. I get goose bumps just thinking of the mad and often dangerous stunts we used to pull. Luckily we survived that crazy era and dare I say, maybe learned from it as well. Near the end of 1986 we decided that our hometown is getting to small for us ? we need to tour. We loaded up the 50?s and went on an (small scale) epic tour to Uilkraalsmond, a coastal holiday town on the south coast. We didn?t have a lot of money so we stayed near caravan parks in the bush. Funny how small things like accommodation didn?t seem to bother kids with big touring plans! Luckily petrol cost less than 70c a liter at the time. The whole tour lasted about five days and I don?t think we even covered more than 500 kilometers. I can still recall riding up a not too steep pass with my fully laden ?Bobcat? in first gear and giving way to a passing truck! Those were the carefree days of dreams and adventure ? I have posted this pic somewhere before but can't resist any opportunity to do it again because I like it so much. 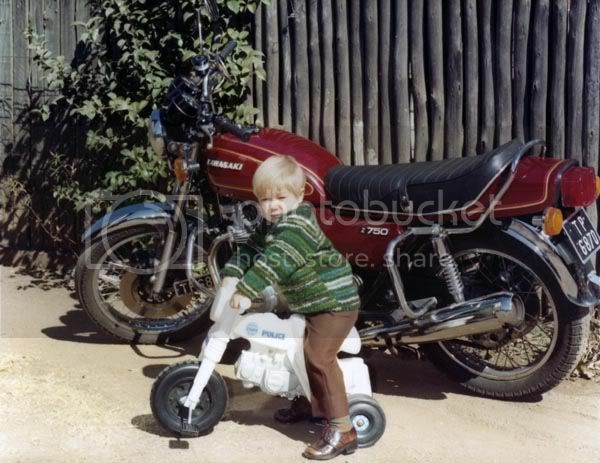 It was taken circa 1983 and I like it because the RD350LC YPVS was my first brand-new bike, because it was such a lekker time (jolling, pre first marriage etc., too young to die etc. ), and because it could do gravel roads on ex-Zwartkops Pirelli tyres. It was also before Attgatt became fashionable, sorry 'bout that. The scratch mark on the left side of the fairing was the result of a low-side near Schoemansville (?) Hartebeespoortdam at night. The bike eventually died a violent death following a tankslapper on the N1 between Jhb. and Pretoria. Oh, yes and I like the pic because I still had all my hair and chicks actually phoned me. Agree. Note the big 23" front wheel, no disc brakes, no mono-shock rear suspension, but best of all, check that big rear sproket! Lots of low-end torque - just the thing for popping a quick wheelie . The Honda XT and Yammie XT must surely be regarded as the first true "dual-sport" bikes? 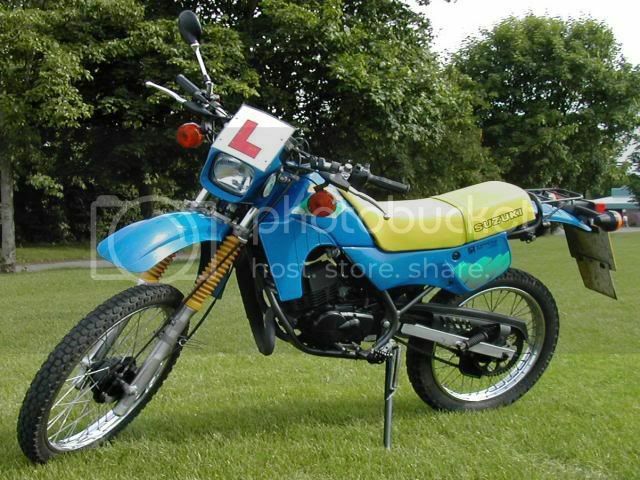 There were more pure off-road jobs (XR's, TT's, etc) available, but these bikes very possibly the first true street-legal 'scrambles' that could go the distance? Maths, beers and bikes - throw in some birds, drop the maths and one can live a decent life i suppose? Sheesh, those days da birds were there to, but definitely running a slow 3rd after Beer Bikes oh yes Rugby to. Is that at Country Trax? Jan du Toit said never in his life did he see a more gorgeous moment. Also had an AR on the farm when we were young. Was later converted to a off-road version. Same size tire front as back. After having to remove the mudguard. Man could that thing jump contours!!! One day came jumping over a contour and landed "THUMP" in one big pool of mud. Straggled for 2 hours to get the bike out. I had the Kawa AE... I loved that little bike! Kilroy, man I wish I had pics from the 80's. But your post sure brought memories.